The Deqing County Court in Zhejiang province held a hearing yesterday on the case of Lu Songbo and Song Laifa, two men accused of involvement in a blackmail scandal. Both of them were charged with extorting 50,000 yuan from a nearby factory, whose pollution they claimed negatively influences local villagers. Seventy three Chinese characters describe the crime. The defendants Lu and Song are local farmers living in Beiduan Community, Zhongguan Village, Zhongguan Town, Deqing County. Lu is the local group leader of Beidun, and he is now being held in detention. Song has been released on bail. About 4 months ago, Lu, Song, and other villagers demanded that the nearby Taiji Chemical Industry Co. Ltd shut down and compensate locals for the harm caused by the factory’s pollution. They made their demands by blocking the gate of the factory. The evidence brought to trial from the Environmental Protection Department shows that Taiji never passed the EPD examination and thus never got approval from the department. On July 8, 2011, the Environmental Protection Bureau of Deqing County initiated a case to investigate the illegal behavior of Taiji. The defendants’ lawyer says this is just an instance of “desperately defending their rights”. The lawyers for the defense are Ding Jinkun and Miao Xinsheng from Shanghai. During the hearing, they contended that Lu and Song are not guilty and defended their actions by claiming that this was, at most, a case of “desperately defending their rights” and should not be confused with blackmail or extortion. Lawyer Ding said that for the past five years, Taiji has been storing, purchasing and selling high-risk chemicals such as sulfuric acid, hydrochloric acid and alkali liquor without inspection by nor approval from the Environmental Protection Bureau. These practices have caused serious pollution to the natural environment of Beidun Community. After fruitless petitions and inaction from authorities, local villagers in Beidun have been demanding the factory’s close since June by blocking and locking the factory gate. Lu, the factory's legal representative, had negotiated with local villagers and was willing to give 300,000 yuan to the nearby residents as compensation. After that, the locals demanded another 50,000 yuan as a compensation for the mineral waste they carried to block the factory gate and to compensate the demonstrators who watched the gate day and night. Lu agreed to this demand, and both parties signed the agreement. “Song and Lu did not plan to keep the money for themselves,” said Lawyer Ding. The villagers all know about the 50,000 yuan. The villagers who helped during the protest were compensated between 50 and 100 yuan per day. The 50,000 yuan was always supposed to be distributed among the villagers. Lawyer Ding admits that there are problems with the methods the villagers used to protect their rights, but their actions were not illegal. The focus is on the veracity of the oral statements given and the settling of this case. In yesterday's hearing, the prosecution and the defense had little doubt regarding the evidence, and now the focus of the argument has shifted to the veracity of the oral statements and how to settle the case. The prosecution contends that Lu, the worker, threatened Lu, the factory representative, that if he did not give 50,000 yuan, workers would continue blocking the factory gate. The defendent denies this accusation and claims that the factory's representative acted on his own free will. Lawyer Ding, for the defence, pointed out that on June 25, Taiji reported to the authorities that they were being extorted, but two days later, they offered 50,000 RMB to the villagers. This does not seem to make much sense. The prosecution countered that what the company reported to the authorities is the 300,000 yuan compensation case, and the alleged blackmail of 50,000 yuan took place afterwards. The defense maintains the view that Taiji illegally deals with chemical products without having passed an environment assessment, polluting the surrounding area. Anyone who suffers from this has the right to demand compensation. According to the spirit of our law, even if the victim's approach to protecting their rights is not appropriate, they are not guilty of extortion unless their method violates criminal law. “This place is like a casino: its business activities are not subjected to legal scrutiny,” said Lawyer Ding. At 11 am, the trial ended with no verdict. The previous protest leader was dismissed for failing to speak for the local villagers. A newly elected group leader now leads the claim for damages. When defendant Lu’s police car arrived at the Deqing County Court around 8:30 yesterday, dozens of villagers followed the van and rushed into the parking lot. Several women, including Lu's wife, stomped their feet in lament. Others were shaking the steel windows of the temporary suspect room so vehemently that the armed police had to stop them. These villagers were all involved in the protest at Taiji, which took place in June of this year. The villagers claim that, aside from blocking the gate, they could not think of any other way to protect their rights. As a letter of complaint demonstrates, the villagers were already submitting petitions related to the factory’s activities in 2006. The letter of complaint is marked with a seal from the Deqing County’s Environmental Protection Office. The office in question responded that they would investigate the matter. “They have not lifted a finger to solve this problem!” a villager said. The company has an excellent relationship with the local government and enjoys their protection. 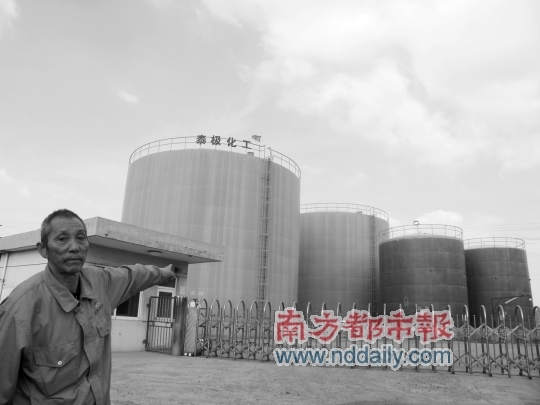 Until this summer, there have been several incidents of farmers blocking chemical plants in Deqing County. Only after the environmental protection bureau came to the countryside to inspect every company, did they place the Taiji case on file. Song was party to the 2006 petition, but Lu was not. According to his relatives, Lu has been working in various places for many years selling thermal insulation material. In early June this year, villagers elected Lu to lead the protest after dismissing the former leader for collaborating with the chemical plant. The weather in Beidun was beautiful yesterday: there was a clear blue sky and a few clouds, but about ten storage towers of powerful acid and strong alkali from Taiji on the side of the road distort this picture. In recent years, the company distributed those high-risk chemical products to small factories nearby, who bought them in bulk. Because of the substandard technology used by the company, chemical liquids leaked out of the tanks during refills and transportation, polluting the soil and water. Many reeds and fish died. With the increase of chemical plants in the countryside in recent years, the number of cancer patients has grown enormously, and no one feels safe.